England's Stove Works deliberately designed the Englander Super 240 with easy home maintenance in mind using standard tools. This Englander stove with its massive 240lb. hopper will burn for up to five days without refilling. This stove has an ash pan. Waste ash must be scooped into the ash pan through access panels on either side of the burn pot. An outside air kit is required when installing this stove. An electrical surge protector is Recommended. Max. Heat Output 56,000 Btu. Window Size 9.25" by 14.75"
Construction Type Steel, Cast Iron Door. Warranty Metal structure of the stove is covered for five years. Mechanical parts, electrical components and glass are covered for one year. 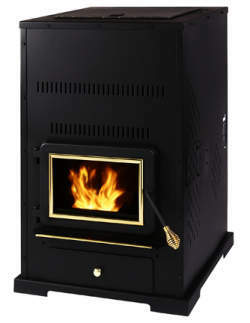 First produced in 2006, this large pellet stove is half way between a room heater and a furnace, this is possibly not a stove for the living space unless you support the ideal of form following function. The convenience of only having to load it every five days is its saving grace. Inspect burn pot, clean wear plate, clean out air holes. Clean ash from behind the baffle plate, remove ash pan cover plates and clean ash from the heat exchanger, scrape creosote from the front of the auger and tube (this can bind the auger and cause a squeaking noise). Remove ash build up from flue pipes. Remove and clean the burn pot, replace the gasket. Clean the combustion blower and its tube, replace gasket. Inspect flue and clean if necessary. If you would like to leave a review of the Englander Super 240, please use the form on the contact page.